Noise is measured according to the standard unit of measure for sound pressure, the Decibel (dB). The dB is a unit used to describe a ratio. The ratio may be power, sound pressure, voltage or intensity, or several other characteristics of sound. So, just as you would use inches, feet, or yards for the length of a board, or ounces, cups, pints, or quarts for liquids, you use the Decibel to measure sound. There are three different sound measurement “Filters” for sound, depending upon which part of the sound spectrum you are measuring - high pitched sounds, medium or normal sounds, and low frequency or bass sounds. 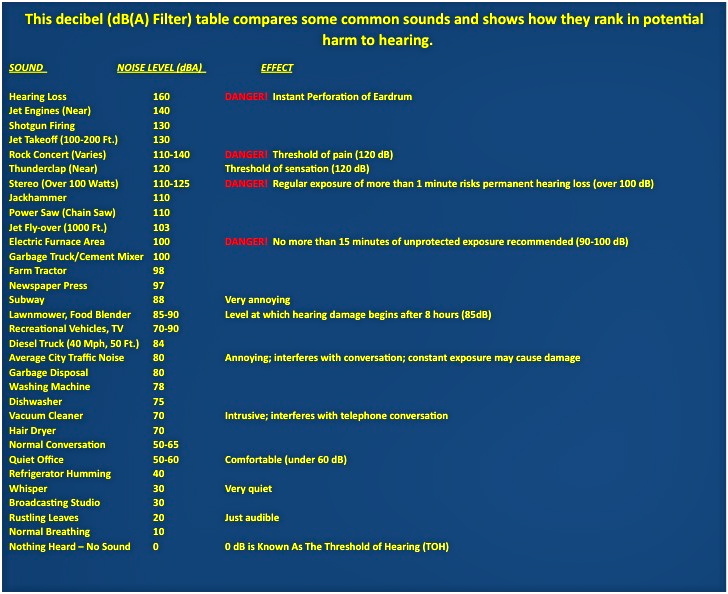 -- The decibel "A" filter is widely used for medium or normal frequencies or sounds within the principal range of the human ear. This is the most frequently used filter when measuring or talking about noise because it covers so much of the sound range audible to human ear. Measurements made with this scale are expressed as dB(A). -- The decibel "C" filter is suitable for measurements at very high sound pressure levels. The decibel "B" filter is between "C" and "A." Measurements made with these scales are expressed as dB(B) or dB(C). Except for very specific measurements for sound engineering applications, dB(B) and dB(C) measurements are not generally used for day-to-day descriptions of everyday noises. How Are Decibel Readings Interpreted? - - Each increase of 10dB is approximately ten times the “power,” but only twice the "loudness." Or, each increase of 10dB is a multiplication factor of 10x for power, and 2x for loudness. - - 20dB is 10x the power of 10dB (an increase of 10dB computed as 10 x 1), and 2 times (2 x 1) as loud. - - 30dB is 100x the power of 10dB (an increase of 20dB computed as 10 x 10), and 4 times (2 x 2) as loud. - - 40dB is 1000x the power of 10dB (an increase of 30dB computed as 10 x 10 x 10), and 8 times (2 x 2 x 2) as loud. - - Jumping to 80dB we would find it 10,000,000x the power of 10 dB (an increase of 70dB computed as 10 x 10 x 10 x 10 x 10 x 10 x 10), and 128 times (2 x 2 x 2 x 2 x 2 x 2 x 2) as loud. - - and so on. What Do Noise Measurements Really Mean? To be meaningful, dB levels are often translated to everyday sounds that people are familiar with for the purpose of establishing comparisons across a broad range of dB levels. While different sources may show slightly different values, below are some common examples.